The 3-D printing process has more potential than ever to transform medical device manufacturing, now that researchers have figured out how to 3-D print miniature batteries. Researchers based at Harvard University and the University of Illinois at Urbana-Champaign have created and tested materials, or "inks," able to function as electrochemically active materials. The materials also had to harden into layers in just the right way so they could be stacked up in layers during the 3-D printing--creating working anodes and cathodes. The recipe included ink for the anode with nanoparticles of one lithium metal oxide compound, and an ink for the cathode from "nanoparticles of another." 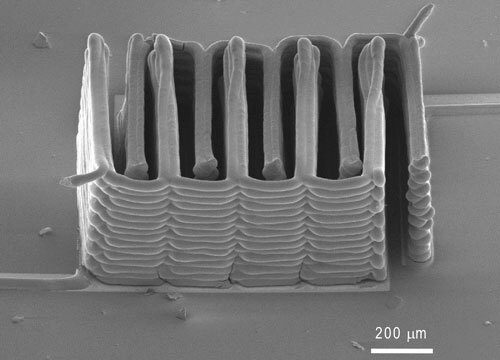 The printer laid the ink onto the teeth of two gold combs to create tightly interlaced stack of anodes and cathodes. The whole setup gets packaged into a tiny container and filled it with an electrolyte solution to complete the battery. "Not only did we demonstrate for the first time that we can 3D-print a battery; we demonstrated it in the most rigorous way," Harvard engineering professor Jennifer Lewis says in a news article produced by the university. Lewis is senior author of a study on the batteries published online in the journal Advanced Materials. The researchers say their tiny batteries have electrochemical performance is comparable to commercial batteries in terms of charge and discharge rate. Also called additive manufacturing, 3-D printing has already gained plenty of attention in the medical device industry for its use in producing partial prosthetic faces and an FDA-approved cranial device that was used to replace 75% of one patient's skull. It is even showing potential for helping fabricate human tissue. Tiny batteries, however, are just as revolutionary, if not more game-changing, because this is about producing the electronic guts of what goes into a device. At trade group LifeScienceAlley's recent conference in Minneapolis, 3-D printing company Stratasys's marketing executive Jon Cobb explained that many engineers are already designing plastic and other parts with 3-D printing in mind, versus traditional manufacturing. "Think of self-powered biomedical sensors, affixed to the skin, that would continuously transmit vital signs to a smartphone. Or existing products could be made more simply and efficiently. For example, the plastic shell of a hearing aid is already 3-D printed for a custom fit inside a wearer's ear. But the electronics are manufactured separately, and the batteries are often the type that must be replaced frequently. If the electronics and a rechargeable battery were printed together, the final product could be made more rapidly and seamlessly." Chris Newmarker is senior editor of MPMN and Qmed. Follow him on Twitter at @newmarker.